I’ve been invited to participate in a 10 day conference and research residency at Pompidou Centre, Paris from 1st – 10th July 2014. The topic we will will be discussing is the exhibition ‘Magiciens de la Terre’, which is now celebrating its 25th anniversary. The exhibition was, and still is, the subject of intense scrutiny and debate, concerned as it was with unifying modes of artistic practice across global dimensions. In preparation for this visit, and to further contextualise my practice of working with museum objects in an art context, I decided to investigate previous examples of artists producing exhibitions using cultural artefacts from different countries. One such example was the work of the Scottish artist, Eduardo Paolozzi, a sculptor best known for “taking bits of machinery or other found objects, and synthesising them into new associations”. 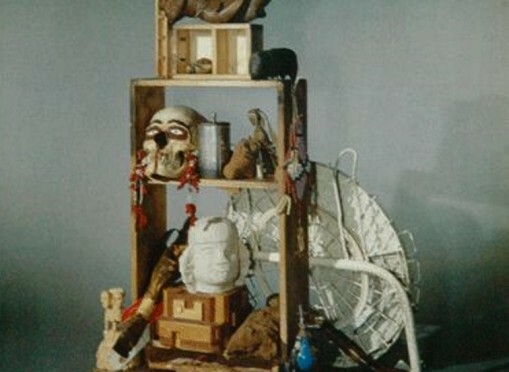 Although Paolozzi stated that his interest was in highlighting “the sublime of everyday life” (1985, p159), and in subverting the tendency to exoticise the other, the choice of the exhibition title ‘Lost Magic Kingdoms’ and the inclusion of divination tools within the selected objects, seemed to run counter to this suggestion. Such techniques were intended to expose the artist’s practice of producing meaning through the correlation of images and objects, but the title also suggests that these original techniques and societies have been superceded or ‘lost’. The relationship between art and magic has continued to fascinate artists and curators, throughout, and despite, modernity, and I will continue to consider this within the context of the ’Magiciens de la Terre’ exhibition in the coming weeks. One of the criteria to achieve doctoral status is the production of new knowledge. 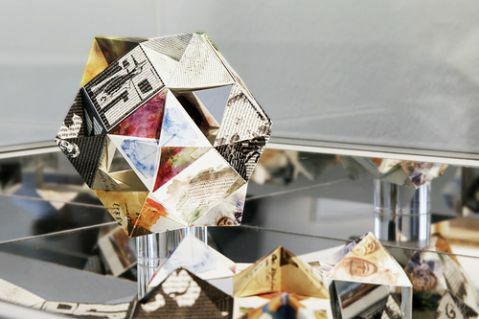 For Practice Based Research in Art this includes the possibility of exploring new methods of research as well as the creation of new artistic works. In understanding how practice-based research contributes to knowledge in an academic sense, it is useful to reflect on the current state of theory relating to artistic knowledge. In 2009, the Stone Summer Theory Institute held their annual conference in Chicago. Organised by James Elkins, and entitled, ‘What Do Artists Know?’ it was initially conceived to interrogate the conceptualisation of art education worldwide, from Foundation level through to PhD. However, in the process of organising the conference, it became clear that there were other ways of understanding the question. Therefore, co-organiser Frances Whitehead also introduced the subject of her own research; the types of knowledge that are particular to the activities and processes undertaken by artists. Such ideas include theories around tacit knowledge and aesthetic cognitivism, “the doctrine that knowledge is contained in artworks”. The conference was conceived as a series of seminars rather than paper presentations, and each of the topics were discussed among the group in order to draw conclusions which would be published at a later date. The topics included: the relevant histories of art education, their practices, ideas, skills, techniques, and how these impact on the current conceptualisation of art education; an understanding of different methods of artistic training outside of major international art schools; and how the terms ‘knowledge’ and ‘research’ apply to artworks, both as vehicles for knowledge and as traces of transformative processes. Elkins outlined the conference proceedings and conclusions in his preliminary report which was published in maHKUzine. Conclusions and areas for further research were published in the book ‘What Do Artists Know?‘ by Penn State University Press in 2012. Contained within ideas of ‘artistic knowledge’ is the deliberate practice of ‘not knowing’. In the publication ‘On Not Knowing: How Artists Think‘, Elizabeth Fisher and Rebecca Fortnum (eds) aim to “map an expansive field of reference that situates the idea of ‘not knowing’ in relation to the artist’s sense of self, the place of the studio and creative problems of language, interdisciplinary practice, education, philosophy and of course, the experience of the viewer… where not knowing is not only not overcome, but thought, explored and savoured” (Fisher and Fortnum, 2013, p7). These essays not only explore art making as thinking through doing, or practice as research, but also consider it in relation to the histories of Western metaphysical thought and the production of knowledge itself. Art as a mode of enquiry has been explored by theorists, including Kant’s ‘genius’, Plato’s ‘technē’, and Levi-Strauss’s ‘bricoleur’. In each case, the ‘artist’ in question veers between knowing and not knowing, utilising the resources at their disposal (in the form of tools, materials, technical ability, and historical awareness) in order to create a framework within which “to experiment without a plan and allow something unforeseen to emerge” (Jones, 2013, pp.20 & 27; Fortnum, 2013, p76; Siukonen, 2013, p92). She continues by outlining particular tactical strategies that artists may use “to produce the conditions of uncertainty, disorientation or indeterminacy”. Such methods include “submission to the logic of a rule or instruction… as a way of surrendering responsibility, absorbing oneself of agency or control within a practice in order to be surprised” as a way of creating a space for not knowing or “rupturing the terms of what is already known” (Cocker, 2013, p127-130). Exploring art as a method of thinking or mode of enquiry has allowed theorists to consider the lateral benefits of art making in a knowledge-based economy. For example, Estelle Barrett suggests that the value of art may extend, and even surpass, the production of the work, due to its specific “processes of enquiry and their potential for innovative application” (Fortnum, 2013, p77). Equally, Donald Schön felt that artistic processes were particularly suited to negotiating risk due to their nature of “reflection-in-action… by which practitioners… deal well with situations of uncertainty, instability, uniqueness”. (Siukonen, 2013, p92) As Fisher states in her opening essay ‘In a Language you don’t Understand’, “such modes of working have helped to reconceptualise art as ‘a place where things can happen’ rather than ‘a thing in the world’.” (Fisher, 2013, p12). However, while it is beneficial to consider the particular benefits of practice and art making to the production of knowledge, the essays here often appear to position text and writing as synonymous with knowledge. Therefore, although text may occupy a hierarchical precedence over image, I propose that the benefits of practice based thinking can also apply to the process of writing and the experience of text in affective terms.